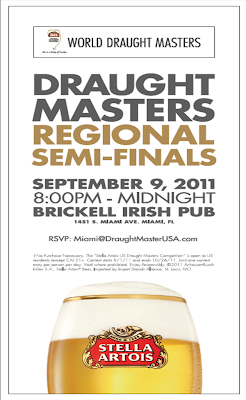 Stella Artois will be holding their Draught Masters Regional Semi-Finals this Friday, September 9th from 8:00pm-12:00am at Brickell Irish Pub. Come out and check out some of the best bartenders from the area pouring Stella's 9 step Pouring Ritual(their term, not mine). The winner of the semi-finals will move on to the US Finals in Washington DC on October 7th and from there the winner will move on to the global competition on Buenos Aires. If you are unable to make it to the Miami Regional on the 9th you can visit www.facebook.com/stellaartoisusa now through Noon CDT on Thursday, Sept. 15. The wild-card winner will be randomly chosen from the top national scorers in the virtual 9-Step Pouring Ritual game on the Stella Artois Facebook page. 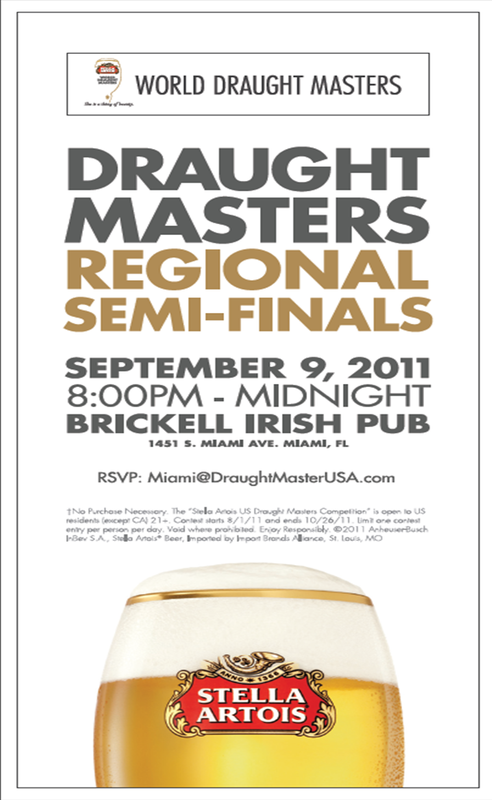 I have two VIP passes for the Draught Masters Regional Semi-Finals to giveaway. 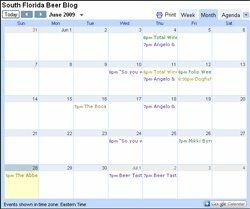 The first person to write to me at dave@southfloridabeerblog.com will get the two VIP tickets. See you there. This seems like a very odd competition. Didn't know that had stuff like this. Is there usually a fairly big crowd? What else goes on there? I wish I was coming down south... this would have been a great event. I am a huge Stella fan!